Nice location. Clean facility, friendly staff. Willing to help. Great complimentary breakfast. I love the room...it was beautiful and large. And free breakfast! Where to find Lockport hotels near an airport? Where can I find hotels in Lockport that are near tourist attractions? 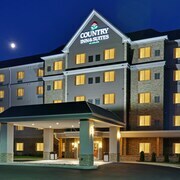 Are you visiting Niagara Falls - Western New York and are looking to choose accommodations in or near Lockport? 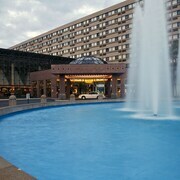 You'll find 3 Expedia-listed hotels within 0.1 kilometres (0.06 miles) of the center of town. 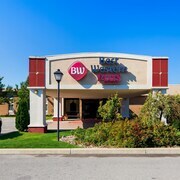 One of the ingredients to trouble-free travel is location, so be sure to check out the Quality Inn and Best Western Plus Lockport Hotel, which can be found within a 1-kilometre (0.6-mile) radius of Lockport's downtown area. 35 kilometres (20 miles) from the middle of Lockport, is the The Mansion On Delaware Ave. Alternatively, the Hampton Inn & Suites Buffalo Downtown is located 35 kilometres (21 miles) away. 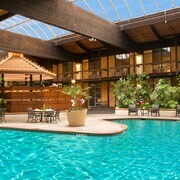 Other hotel options include the Homewood Suites by Hilton Buffalo Airport and the Residence Inn by Marriott Buffalo Galleria Mall. Why not enjoy the many delights around Niagara Falls - Western New York while you are here? 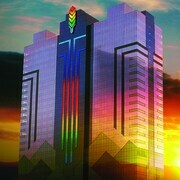 Check out Niagara Falls - Western New York's art galleries and theaters and also enjoy the region's lakes. Locals and visitors alike in this region of United States of America commonly enjoy ice skating and guided nature walks. Spend some time discovering Bridal Veil Falls and Niagara Falls State Park, which you'll find in Niagara Falls, 30 kilometres (19 miles) to the west of Lockport. Some of our recommended Niagara Falls accommodation options include the Great Wolf Lodge , Ripley's Water Park Resort and Ellis House Bed and Breakfast, Niagara Falls. 30 kilometres (19 miles) to the southwest of Lockport, you'll also find Downtown Buffalo, home to the Lofts on Pearl and Hotel @ The Lafayette. While visiting Downtown Buffalo, set aside a little time to check out the Greater Buffalo Sports Hall of Fame and Old Erie County Hall. If watching sport is what you love, head to First Niagara Center, which is 35 kilometres (22 miles) to the southwest of Lockport. Sports fans wanting to find accommodation near to the action can choose from the Embassy Suites Buffalo or the Hyatt Regency Buffalo / Hotel and Conference Center. Buffalo Niagara International Airport is situated 25 kilometres (16 miles) from Lockport. 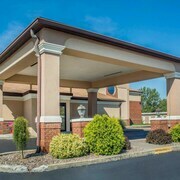 If you choose to stay close by, can easily secure a room via Expedia at the Hampton Inn Buffalo-Williamsville or the Fairfield Inn & Suites by Marriott Buffalo Airport. What are the most popular Lockport hotels? Are there hotels in other cities near Lockport? 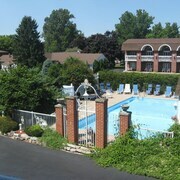 What other types of accommodations are available in Lockport? Explore Lockport with Expedia.ca’s Travel Guides to find the best flights, cars, holiday packages and more!